A bioinspired robot has provided the first experimental evidence that live zebrafish can be influenced by engineered robots. Results published 8 June in IOP Publishing's journal Bioinspiration and Biomimetics, provide a stepping stone on the path to using autonomous robots in an open environment to monitor and control fish behaviour. In the future, water-based robots could potentially contribute to the protection of endangered animals and the control of pest species. 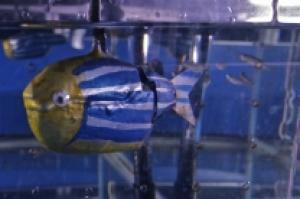 The robot, created by researchers from Polytechnic Institute of New York University and Instituto Superiore di Sanitá, Italy, was 15 centimetres long and spray-painted with the characteristic blue stripes of the zebrafish. The tail of the robot was mechanically controlled by the researchers to mimic the action of the zebrafish itself. When placed in a 65 litre fish tank, the movements of the robot's tail attracted both individual and shoals of zebrafish; the researchers believe that such capability was influenced by its bioinspired features which were optimised to increase attraction. For example, the robot was given a rounder shape to mimic a fertile female, which is preferred by both male and female zebrafish, and its colour pattern -- a magnified stripe width and saturated yellow pigment -- emphasized distinctive biologically relevant features. The robot was in a fixed position in the tank so that the tail movements could be controlled, recorded and, most importantly, associated with the behaviour of the zebrafish. The fish tank where the experiments took place was divided into one large middle section and two smaller sections at either end, separated by transparent Plexiglas. A total of 16 experiments were performed in which individual, and then shoals of, zebrafish were placed in the middle compartment of the tank and two stimuli were placed at either end behind the Plexiglass. The combinations of stimuli were: one fish versus an empty space; ten fish versus an empty space; ten fish versus one fish; the robot versus an empty space, and the robot versus one fish. A camera was placed above the tank to monitor the movements of the zebrafish, and statistical tests were performed to calculate whether the robot acted as an attractive, neutral or aversive stimulus and whether this relationship depends on the fish being isolated or in a shoal. Although the live zebrafish tended to prefer each other to the robot, when given the choice to spend time next to the robotic fish or an empty space, both the individual fish and shoal of fish preferred the robot. While the noise of the robot's motor was shown to decrease its attraction, the actual beating of the tail emphasized its attractiveness. The corresponding author, Dr Maurizio Porfiri, said: "These findings provide practical evidence that a species' preference for conspecifics may be used to inspire the design of robots which can actively engage their source of inspiration. "New studies are currently underway in our lab investigating the interactions between fish and robotic fish when they are free to swim together under controlled and ecologically complex conditions."